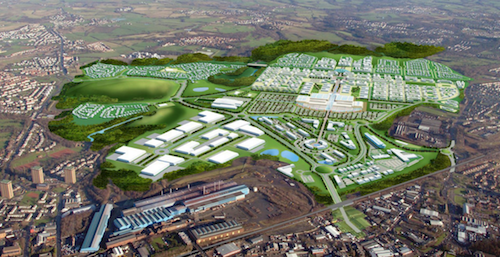 North Lanarkshire Council said on Tuesday that more than 6,500 jobs could be created and around £360 million per year generated for the local economy after the Glasgow City Region councils approved revised plans for the Ravenscraig Infrastructure Access (RIA) project. At 455 hectares, Ravenscraig is one of Europe’s largest brownfield regeneration sites and accounts for 13% of the Glasgow City Region’s vacant and derelict land. Improved transport infrastructure at Ravenscraig and the surrounding area has moved a step closer after North Lanarkshire Council approved an extra £29.7 million of investment and the Glasgow City Region cabinet allowed City Deal funding to be reprioritised for the project. Councillor Paul Kelly, depute leader of North Lanarkshire Council, said: “The regeneration of Ravencraig is of major strategic and economic importance to North Lanarkshire and the wider area. “The £201 million Pan-Lanarkshire Orbital project represents the biggest single roads and infrastructure investment in North Lanarkshire’s history, and our focus must be on those projects that will attract investment to the area and be of the greatest economic benefit to our communities. “Channelling our resources into creating a first-class infrastructure at Ravenscraig will bolster future investment from the private sector to create homes, businesses and job opportunities – potentially creating 6,500 jobs and generating £360 million in Gross Value Added (GVA) for the local economy. The council said its decision to prioritise the City Deal projects that will deliver the maximum economic benefit to the community and wider area means realigning resources within the other City Deal projects in North Lanarkshire.